The Flower Farmer by Lynn Byczynski is considered a must-read, top-shelf resource by many. After finishing the book, I can totally understand why! I’ve heard so many interviews and podcasts where people mention that this was the transformational book for them. A lot of “dreamers” have taken the leap and started their farm using this book. The book was published in 1997 and then a second edition came out in 2008. Byczynski really seems to be one of the pioneers of sharing information on her flower farming experience and the local flower movement. She covers all the burning questions I have about starting a new farm. What really impressed me is that I felt like I came away with actionable information. The information was simple, cost-effective and doable. Loved the features on different flower farmers around the country. It was really interesting to hear how everyone got started and about the paths their businesses took. This book is realistic. She goes into detail on how to start just about every aspect of the business. What’s the minimum effort to get a seed-starting area going? How do you start selling to florists? How do you work with a grocery store for the first time? How do you choose what to grow? All the information feels very attainable. Even though she’s been flower farming for more than 20 years, it feels like she remembers just starting out. So. Many. Resources. Seed and bulb suppliers, tools, irrigation suppliers and more. There’s lots of information on growing and harvesting specific genera of flowers, as well as recommended varieties. This book really helped me get a handle on the bare minimum I need to get started. I have basic ideas for seed starting and irrigation because of her recommendations. She focused mostly on production, but I did appreciate the primer on floral arranging. I don’t have plans to offer arranging as a service, except for myself or possibly for markets. I’m more interested in figuring out growing first! But her intro made me realize I should familiarize myself with some basics, even if just to make prettier arrangements for friends and family! She has a section on dried-flower gardening, which I had never even thought of before. I don’t know how interested I am in dried flowers, but it’s always fun to find new possibilities. I’ve been very interested in a natural dye garden, so I may combine the two ideas. Here’s a link to the book! I’m still not sure if I’ll do vegetables for market. My plan is to get through a few seasons before deciding to give it a go or not. If I do or don’t, this book was a valuable read. Right away, I saw a lot of parallels between this and another book I just read, How to Grow More Vegetables. Both are using biologically intensive methods. Fortier mentions in this book that they don’t produce their own fertilizers or compost. Most of it is brought in. They do experiment with cover cropping for soil improvement, but the schedule gets a little messy with so much to plan for succession and rotation. But intensive spacing and improving soil are found in both books. There’s an estimation at the beginning of the book that I really appreciated. His opinion is that less than 2 acres of intensively cultivated land is the optimal size for farming without a tractor. He also believes that one full acre of diverse vegetables is about the maximum one person can manage. Since I’m planning on it being one person doing the work (me) and not using the tractor regularly (I may for initial bed prep), this estimate was a useful guide. I also added a new area of my property into production consideration because of his recommendation for a site with a less than 5% southern slope. A really interesting technique was the Stale Seedbed Technique, where you grow weeds in your bed as well as you’d grow your vegetable crop. Then you knock ’em down, cover ’em and plant your real crop. Apparently it’s a necessity for some crop’s weed management. How tactical he is about growing. It really resonates with my planning/record-keeping obsessions that he is so detailed. He treats it like a business, listens to what customers want and knows what his product is worth. Love the resources, for both growing considerations and supplies. The tools section was really thorough on hand tools. There’s a ton of information! It really sets you up to get started with a highly productive market garden. He has detailed sample crop rotation and planting schedules. This is a book you go back to when you’re ready to plan for the season. I also thought it was really valuable to read for initial farm setup (or early farm setup). I’m torn with what to do for my bed sides. Fortier is passionate about 30″ wide beds, as well as Curtis Stone over at the Urban Farmer. I love the 30″ width, I think it makes a lot of sense. My conflict is with Floret Flower’s recommended bed sizes of 48″. She has a really cool system of about 5 different spacing groups and puts each flower into one of those groups. Her groups make more sense starting with 48″. So, I think I’m left with making everything 48″ wide. I don’t know if it makes sense to have flower beds 48″ and vegetable beds 30″. Then I could run into issues sharing supplies between them (thinking of things that are cut, like landscape fabric and row covers, etc). I’ve been getting this from every book I’ve read lately, but obviously it’s going to be really helpful to get a hoophouse. He gets a lot of use out of his. His watering system is different from the usual recommendation of drip irrigation. I really like the way they do it, but again, with flowers I’m not sure overhead watering would be the best. I also have to be careful with some spots on my property that get sun later in the morning because of a woodland edge that surrounds us. Don’t want too much moisture sitting on everything for too long. 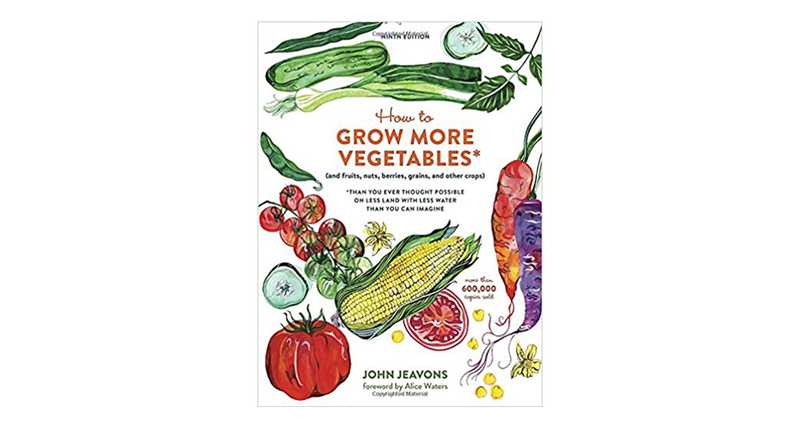 I read a recommendation for “How to Grow More Vegetables” from the book “Floret Farm’s Cut Flower Garden” (read my review here). 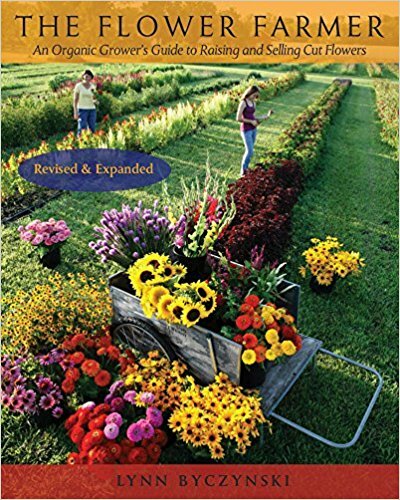 In the “Cut Flower Garden”, author Erin Benzakein shares this book as an influence for her flower spacing system. She gives the system credit for allowing her to grow so intensively on her small-scale farm. Ecology Action is the site where the research and methods mentioned in this book are tested and created. Over the last 40 years, they’ve developed their own trademarked system of production methods called GROW BIOINTENSIVE. Ecology Action offers internship, training, education and publications surrounding their system and continued findings. You can tell that long-term sustainability is a huge driver for the continual development of their system. Jeavons believes that we need to keep half of the world’s farmable land natural and wild to preserve plant and animal diversity – meaning we need to be more sustainable and efficient on the land we do farm. He also believes current world hunger solutions may create long-term dependencies and that a better solution is to train people in sustainable, productive ways so they can produce for their community. All about planning, lay out and the creation of new beds as well as bed maintenance once established. The compost sections are very detailed and cover a lot of information. This was one of the sections were I was kind of overwhelmed. The philosophy for long-term, sustainable farming includes growing your own compost and fertilizer to reduce imports from other locations. He argues that importing is unsustainable, and depletes unrelated ecosystems from your production area. This was a realization for me, and I completely agree that whatever can be done onsite, should. However, just starting out with everything else to do, it’s intimidating. He recommends working towards this ideal, and that inputs will most likely be needed in the beginning to get you started. The guide to more sustainable fertilization includes: growing your own food and composting the residues, growing trees to bring nutrients to the topsoil, growing your own fertilizer, maintaining proper level of organic matter in the soil, and yes, exploring “proper, safe, and legal ways to recycle human waste”. The section that led me to the book! It has useful spacing recommendations and the whys behind them. I do wonder, though, if this information could be found elsewhere in more detail. For example, Floret’s book actually has WAY more flower type spacing examples than this one, which only gives you a few. Still, lots of information in this section. Definitely a reference section. I skimmed through a lot of this and marked areas to come back to when I need them. This book is very detailed, and while I know the information is useful – it was almost too detailed for me just getting started. There were points where I felt overwhelmed at the amount of work it suggested. Even though I read the 9th edition, which came out a few months ago, almost every reference to another resource is quite difficult to find. I tried searching Amazon for almost every book suggested and many didn’t even have a third-party used option available. Sometimes it felt like advertising for the GROW BIOINTENSIVE method in particular. There were a lot of claims and I found myself writing a few times in the margins, “is this true?” to go back and research more later. I’m glad I read it. Some of the ideas this book sparked will be much easier to plan while I lay out my initial farm plan. Overall, it has a lot of recommendations for tools, fertilizers, insect controls, etc. I’ll reference it during initial setup and revisit it again when I start expanding. I completely loved this book! 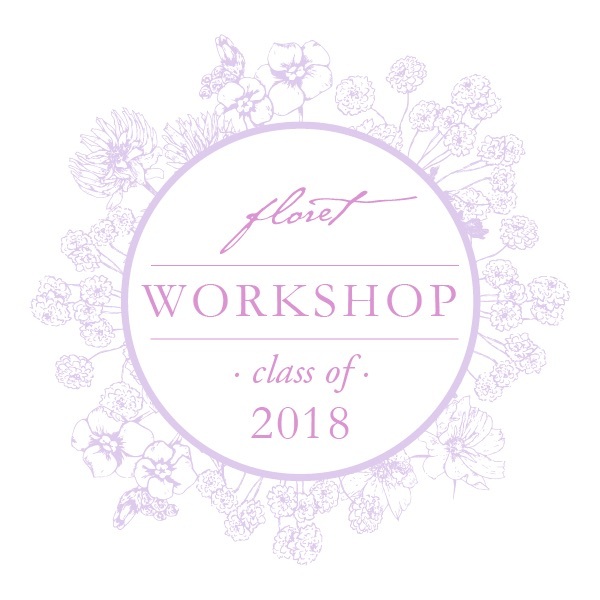 I recently learned of Floret Flower Farm due to the book release, and became an instant fangirl. Imagining all the effort, hard work, research and time that went into creating such a magical place is really inspiring. I’ve always loved cut flowers, but wasn’t convinced to dedicate much time or room for them in my future garden plans. I thought they would be hard to grow, or that I’d have to stick to the same varieties grown over and over again in my area. Well, not anymore! Now a spectacular cut flower garden is a must! The photos were amazing! Her interesting descriptions created so much anticipation to turn the page for photos. Discovered so many great varieties! Tips on spacing, staking and vase care were helpful. Inclusion of trees, shrubs, vegetables, and vines was exciting. I’m not a bouquet maker (yet! ), so this blew my mind. I loved the way it kept arrangements so natural-looking. The projects for each season were incredible. It was neat to see all the elements come together. I would love to see an aerial image of the whole farm layout to get a feel for how much she’s squeezing out of the space. I also have nosey questions like: Does her 2 acres include a house? How many high tunnels does she have? Some insight into her processes, just for fun. What does her garden journal look like? What tools are useful for planning? How many people help on the farm? This is a book I will reference again and again for its beauty and inspiration – and while I design my garden! I’ll be doing some thinking on how to translate her scale down to my needs. Brainstorming incorporation of cut flowers into a vegetable garden, mixed landscape or ecological garden. I’d like to start some in-depth research on the intensive planting techniques I’ve been hearing about lately.